What's the Difference Between Azorean and Portuguese Cuisine? The Azores are a region in Portugal, but their cuisine is unique. Azorean cuisine, native to the Azores Islands, is a rich, hearty, peasant-based style of cooking. Its flavors sing of seafood, spicy stews, sweet desserts, and rich dairy products, but most people assume that the foods of these islands are the same as Portugal’s—if they have even heard of the islands. While some of the dishes are even the same, Azorean and Portuguese cuisines are actually quite different. The Azores is an archipelago of nine islands of various sizes, all of which are geographically isolated, both from the mainland and from each other. They lie in the Atlantic Ocean approximately two-thirds of the way between the United States and the coast of mainland Portugal. This is one of the main reasons that the food of the Azores is so little known—it isn’t easy to get to them and, in fact, it isn’t even that easy to get from one to the other! Even today, people who live on one of the islands are more likely to have been to the mainland or traveled to other parts of the world than to the other islands in their archipelago. Dairy: The Azores are famous for their rich dairy products. Cows tend to be used for milk rather than as meat (pork is the main meat used in cooking). At breakfast, you are likely to be served a small glass jar filled with local yogurt, bread spread with rich butter, and coffee with lots of steamed whole milk. Cozida: A unique type of food that comes from the island of Såo Miguel, the biggest island. This is a sort of one-pot meal that is actually cooked by digging a hole in the ground near the famous caldeiras (hot geysers) of Furnas. 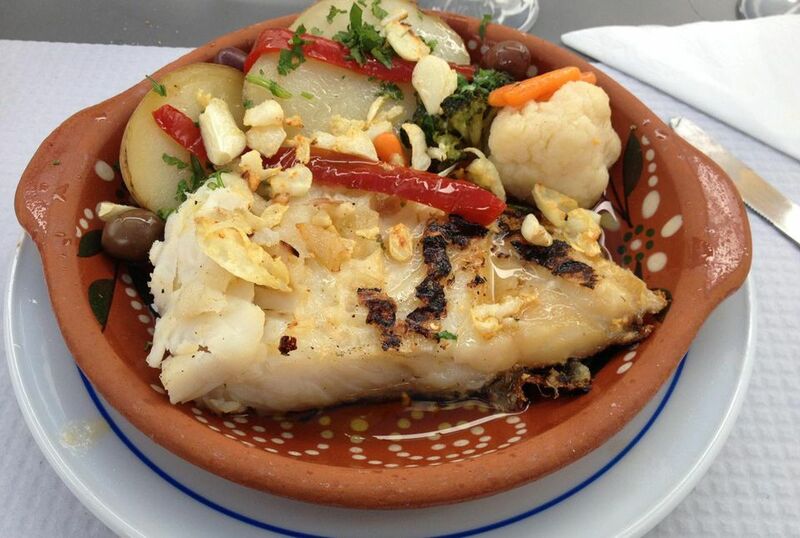 Alcatra: A popular Azorean dish that hails from the island of Terçeira. This pot roast-style dish can be made from pork, beef, or another animal and is slow-baked with tomatoes, onions, garlic, and a bit of clove. Seafood: Seafood is prominent in both Portuguese and Aorean cuisine. Bacalhau (cod) and other fish figures heavily in the mix, but there is a heavier use of polvo (octopus), lamprey and limpets. Ananas: Pineapples, or Ananas, are grown on the island of Såo Miguel and are exported heavily to mainland Portugal. It is frequently seen on the menu of Azorean restaurants for dessert and is the rare exception to the richly sweet dishes that characterize most of the Azorean repertoire of desserts. Massa Sovada: Portuguese sweet bread, massa sovada, originated in the Azores and is a common part of Christmas and Easter for both Azoreans and mainland Portuguese. For Easter, it is often baked with hard-boiled eggs in the center of the loaf. Malasadas are round balls of dough that are deep-fried and rolled in granulated sugar, almost like a donut, that supposedly originated in the island of Såo Miguel.